The Ritz-Carlton Hotel Company, L.L.C. today announced the opening of reservations for The Ritz-Carlton Yacht Collection. With a leisurely cruising style, the legendary service of The Ritz-Carlton, and ports at sought after destinations around the world, The Ritz-Carlton Yacht Collection will deliver one-of-a-kind experiences to its guests onboard and transform the luxury cruising industry. "As the first luxury hotel company to bring the legendary service and ambience of its resorts to sea, we are thrilled to offer guests a new way to create memories with The Ritz-Carlton," said Lisa Holladay, Global Brand Leader for The Ritz-Carlton. "From the yacht's design, to programming onboard and ashore, every aspect of the voyage has been carefully created to embody the signature service and casual luxury of a Ritz-Carlton resort. We look forward to officially welcoming guests onboard The Ritz-Carlton Yacht Collection as we open reservations." 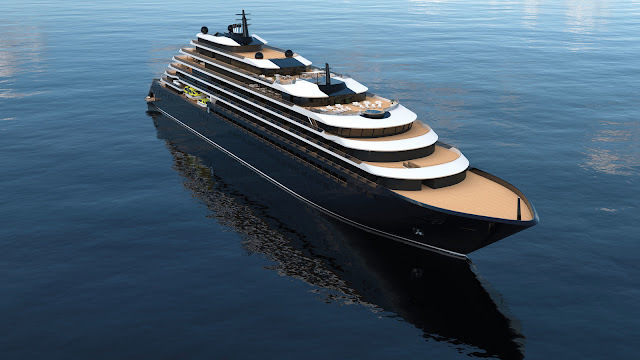 "The opening of reservations marks an exciting milestone for The Ritz-Carlton Yacht Collection, which is set to redefine luxury at sea," said Doug Prothero, CEO of The Ritz-Carlton Yacht Collection. "Whether you are looking for culture, adventure, or the chance to go off the beaten path, we are thrilled to be able to invite guests to explore the world with The Ritz-Carlton Yacht Collection." Customers are also encouraged to visit the newly launched website for The Ritz-Carlton Yacht Collection, which offers full details of itineraries, pricing, and onboard experiences. Guests can browse for voyages by region, departure date or ports of interest using the "Find a Cruise" feature, view suite and fare information, explore the yacht experience, and more. The website additionally features a downloadable digital brochure for The Ritz-Carlton Yacht Collection, with engaging imagery and further itinerary information for the inaugural season. Designed with a yachting lifestyle in mind, the first of three bespoke yachts in The Ritz-Carlton Yacht Collection will stop at both signature and iconic destinations. Its intimate size allows for the vessels to sail into coveted city harbors around the world, and the relaxed pace of the yachts offers both daytime and overnight ports of call, giving guests more flexibility for their time on land. The first yacht will cruise a wide variety of destinations, including the Mediterranean, Northern Europe, the Caribbean, Latin America, Canada and Northeastern United States. Voyages will range from seven to ten nights with ports including Barbados, Cartagena, Bordeaux, Copenhagen, Mykonos, Portofino and many more. Each itinerary is packed with unique programming at each destination, from the Christening Celebration on the Inaugural Voyage to the Monaco Grand Prix, Edinburgh Military Tattoo, exploring the yachting playgrounds of the Greek Isles, Balearic Islands and French Riviera, as well as celebrating the holidays in the Caribbean. The specially designed yacht will measure 190-meters, accommodate up to 298 passengers and feature 149 suites, each with its own private terrace. The yacht will also feature two 158 square-meter lavish Owner's suites, each with its own private whirlpool, modern craftsmanship and interior finishes jointly designed by The Ritz-Carlton and leading design firm Tillberg Design of Sweden. The onboard experience will reflect the sublime comfort and unparalleled level of individualized guest service for which the iconic Ritz-Carlton brand is recognized, with one of the highest staff to guest service ratios in the cruise industry. The Ritz-Carlton Yacht Collection guests will enjoy an all-inclusive luxury sailing experience including spacious accommodations, onboard activities and entertainment, beverages, multiple dining venues, onboard gratuities, WiFi and watersports from the yacht's marina. Signature experiences available for an additional fee include a culinary experience at Aqua, the yacht's signature restaurant designed by Michelin-starred chef Sven Elverfeld, spa treatments, and immersive excursions offered through The Shore Collection. Voyage prices vary based upon the itinerary and season. The yachts of The Ritz-Carlton Yacht Collection are also available for private charter. For more information, please visit www.ritzcarltonyachtcollection.com. For reservations, contact a Yacht Vacation Consultant at (833) 999-7292 (U.S. & Canada) or contact your travel professional. The Ritz-Carlton Hotel Company, L.L.C., part of Marriott International, Inc., currently operates more than 95 hotels and over 45 residential properties in more than 30 countries and territories. The Ritz-Carlton is proud to participate in the industry's award-winning loyalty program, Marriott Rewards® which includes The Ritz-Carlton Rewards®. Members can now link accounts with Starwood Preferred Guest® at members.marriott.com for instant elite status matching and unlimited points transfer. For more information or reservations, visit the company web site at www.ritzcarlton.com, for the latest company updates, visit news.ritzcarlton.com and to join the live conversation, use #RCMemories and follow along on Facebook, Twitter, and Instagram. The Ritz-Carlton Hotel Company, L.L.C. is a wholly-owned subsidiary of Marriott International, Inc. (NASDAQ: MAR). Marriott International, Inc. (NASDAQ: MAR) is based in Bethesda, Maryland, USA, and encompasses a portfolio of more than 6,500 properties in 30 leading hotel brands spanning 127 countries and territories. Marriott operates and franchises hotels, and licenses vacation ownership resorts all around the world. The company also operates award-winning loyalty programs: Marriott Rewards®, which includes The Ritz-Carlton Rewards®, and Starwood Preferred Guest®. For more information, please visit our website at www.marriott.com, and for the latest company news, visit www.marriottnewscenter.com. In addition, connect with us on Facebook and @MarriottIntl on Twitter and Instagram.